Abstract Walking has always been the most common loco­mo­tion mode for humans in the real world. As a result, it has also been con­sid­ered as the gold stan­dard in a large body of Virtual Reality research involv­ing nav­i­ga­tion. Physical walk­ing pro­vides body-based sen­sory infor­ma­tion (e.g., kines­thetic, pro­pri­o­cep­tive, vestibu­lar) about both trans­la­tional and rota­tional com­po­nents of loco­mo­tion. Though full rota­tion is no longer a tech­ni­cal chal­lenge with recent advance­ments in track­ing tech­nol­ogy, phys­i­cal trans­la­tion is still restricted through lim­ited tracked areas, which are also asso­ci­ated with many other con­straints, e.g., cost, safety, cable, space require­ment, and com­pu­ta­tional power. From the sci­en­tific per­spec­tive, while the rota­tional infor­ma­tion has been shown to be impor­tant for sev­eral spa­tial tasks, the ben­e­fit of the trans­la­tional com­po­nent is still unclear with mixed results from pre­vi­ous stud­ies. For these rea­sons, we con­ducted a mixed-method exper­i­ment to inves­ti­gate how pro­vid­ing dif­fer­ent levels of trans­la­tional body-based sen­sory infor­ma­tion asso­ci­ated with dif­fer­ent loco­mo­tion inter­faces might improve per­for­mance, and how close it could get to actual walk­ing. 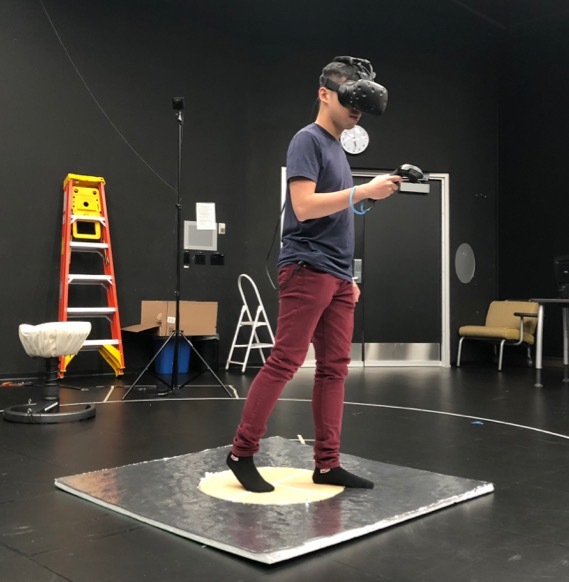 We com­pared four levels of trans­la­tional body-based infor­ma­tion: none (par­tic­i­pants using the track­pad of the HTC Vive wand con­troller to visu­ally trans­late), upper-body lean­ing (par­tic­i­pants sit­ting on a Swopper chair, lean­ing their upper-body to con­trol their visual trans­la­tion), whole-body lean­ing (par­tic­i­pants stand­ing on a plat­form called NaviBoard, lean­ing their whole body or step­ping one foot off center to nav­i­gate the vir­tual envi­ron­ment), and full trans­la­tional infor­ma­tion (par­tic­i­pants phys­i­cally walk­ing). In each con­di­tion, par­tic­i­pants wore a head-mounted dis­play and per­formed a nav­i­ga­tional search task. Results showed that the trans­la­tional infor­ma­tion had sig­nif­i­cant effects on var­i­ous mea­sures includ­ing task per­for­mance, task load, and sim­u­la­tor sick­ness. While par­tic­i­pants per­formed sig­nif­i­cantly worse when they used a con­troller with no trans­la­tional body-based infor­ma­tion, com­pared to the other con­di­tions, there was no sig­nif­i­cant dif­fer­ence between the leaning-based inter­faces and actual walk­ing. Moreover, par­tic­i­pants per­ceived sig­nif­i­cantly less motion sick­ness and task load in the NaviBoard and Walking con­di­tions. 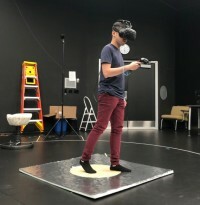 These results sug­gested that trans­la­tional body-based infor­ma­tion from a leaning-based inter­face might pro­vide a cost-effective alter­na­tive to actual walk­ing in spa­tial cog­ni­tion research and appli­ca­tions in VR.